Prepared by master’s candidates Cristina Strunk and Emily Veno in collaboration with Pamela A. Mason Ed.D., Harvard Graduate School of Education. Melody Lewis-Kane, M.A., consultant. I Know a Man … Ashley Bryan, 15:48 minute shortened educational version. Click here or on the title to access the film on Vimeo. The Guides are designed as companions to the film. I Know a Man …Ashley Bryan paints a tender portrait of a uniquely American life. 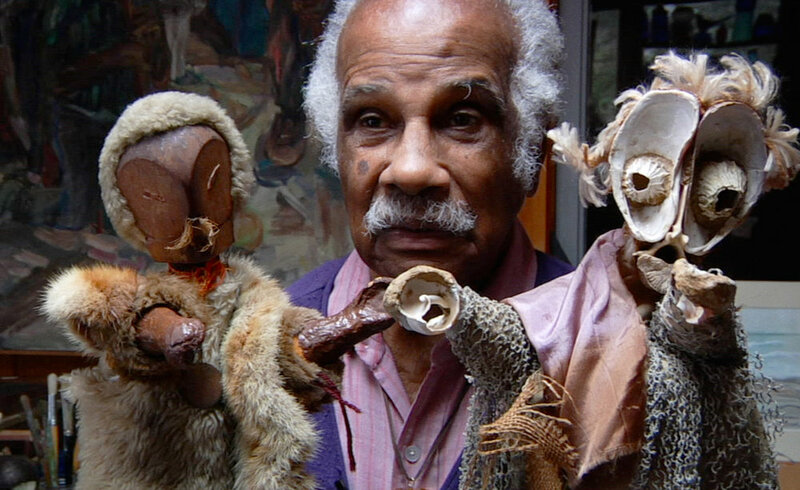 An exploration of the work and philosophy of 95-year-old artist Ashley Bryan, this short film is rich with connections to English Language and Visual Arts content areas. By providing ideas for discussions, creative activities, and resources for students and teachers, this Educator Guide serves as a springboard for deeper learning in response to the film’s topics and themes. How do people find “purpose”? What makes life worth living? Does this change as we get older? If so, how? What inspires artists to create? Can art be used to help people? Each activity in this guide can stand alone or be done together in any order. Activities come complete with essential questions, material lists, and relevant core standards. Since you know your students best, we encourage you to adapt activities to serve your needs! A medium is a material, method, or form an artist uses to communicate their message. Before watching the film, see how many artistic mediums your students can name (paint, clay, glass, colored pencils, watercolors…) As your students watch, have them each make their own list of the mediums Ashley Bryan uses or mentions. After watching, compare lists. How many mediums were mentioned in total? Did you name them all? Which medium was your favorite? 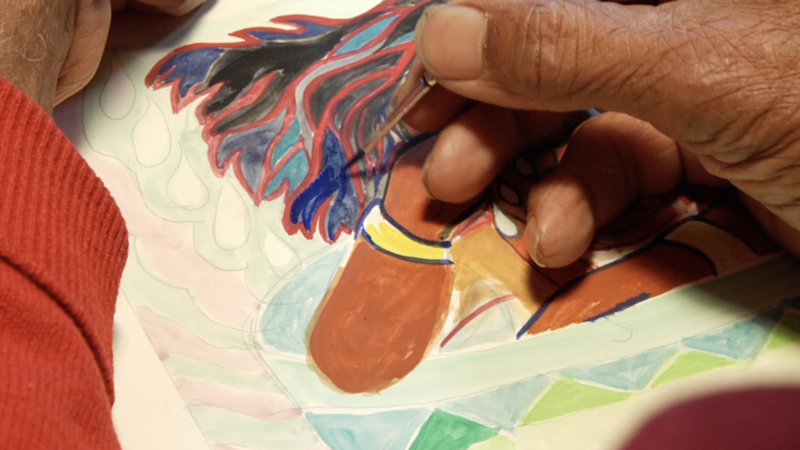 Key: In the film, we see Bryan create paintings, sea glass mosaics, puppets, sketches, poetry, stories, paper cut-out illustrations, and linoleum block prints. Below is a list of terms, references, and definitions your students may not be familiar with that appear in I Know A Man...Ashley Bryan. You may choose to hand out the list or review only the items that you anticipate will be new for your class. Hiroshima and Nagasaki: Two cities in Japan. Hiroshima was the target of the first atom bomb, which was dropped by the United States in 1945 and resulted in the deaths of about one third of the city's population. Together with a second attack on Nagasaki three days later, this led to Japan's surrender and the end of the Second World War. Use the below questions for a conversation as a whole class, or split students into groups, assigning them each a question. If time allows, encourage students to represent their answers creatively, in both written and visual or performance form. (Ideas: posters, murals, paper sculptures, songs, or dances.) Anticipated responses are included next to each question in italics. Essential Question: How do people find “purpose”? What makes life worth living as we age? He can paint anything he sets his heart to. If he paints a picture of it. He knows that to face anything that hurts he can do it. Transform the sorrow if he paints a picture of it. This is how he lives. This is what he does. Pass out copies of the above poem, featured in the beginning of the film, and read it aloud as a class. The first four words serve as the film’s title, and the themes relate to the Essential Question about aging. Ask students what they think the poem tells us about Ashley Bryan. Why does he love to paint? Each student will use their list to write a ten-line poem about their activity, inspired by The Artist. They can use their reasons to inform their writing, need not worry about rhyme, and can write in third person, as Bryan does. Below is an optional template. Tip: Have students write a first draft and practice reading it to a partner. They should make edits based on how the poem sounds aloud, and then write a final draft. This is how he/she ______. This is what he/she ______. Arts Extension: Once poems are written, students can illustrate their final draft with drawings, colorful borders, or collages. Essential Question: What inspires artists to create? Can art be used to help people? Ashley Bryan uses found objects to make puppets. Found objects are natural or man-made objects that are found by an artist and repurposed into an artistic material. Often, artists will use objects to inspire their work, taking notice of their shape, color, or texture to spark their imagination. Recycling existing materials helps both the art and the Earth’s environment! You might choose to offer the option to make either a puppet or a portrait, or structure this activity around one form in particular. Your available materials can help guide this decision. Large materials like boxes, bags, cardboard, and fabric make good bases for puppets. Smaller materials, assembled on canvas or poster board, are best for portraits. Prep: Asking students to aid in the object finding process can be helpful for you and fun for them. Search around home or your school for anything that seems interesting—think outside the box! Plan how to best arrange objects/supplies “buffet style” in your classroom, so students can select the objects most inspirational to them. Each student should imagine a famous person, historical figure, or fictional character/mythological figure who inspires them. They should spend some time looking at photos or doing other research about their chosen person. You might choose to narrow this prompt by focusing on a time period or fictional work you are studying. Give students no more than ten minutes to select found objects from the “buffet” to use for either a puppet or a portrait of their chosen person. Encourage them to not think too hard about what they will use each object for—instead choosing objects they are inspired by, or that remind them of the person. Use the remaining time to construct the puppets and/or portraits. Portraits can be assembled by gluing objects to poster board, foam core, or another thick material. For bigger objects, hot glue may be necessary. Have each student write a short “Artist Statement” about their puppet and/or portrait. Why does their chosen person inspire them? Do any of their found objects have special meaning related to the subject? Display the finished portraits and/or puppets around the room. Can students tell what person inspired each artwork? What were some of the most interesting object choices? Puppet Show Extension: If students made puppets, give them a chance to use them in performance! Students can work in groups of 2-3 to script, rehearse, and perform a short piece featuring their puppet characters. Depending on the people who inspired their work, they might choose to structure the scene as a conversation between different famous figures, or a re-enactment of an event in history or literature. Encourage students to create a “stage” for the puppets that hides the arms of the puppeteers, using large boxes, desks, or paper.